UPDATE 20 October 2011: Tesco has contacted BFLG saying it has stopped this promotion following our complaint (see below). Despite this, we continue to receive reports of the same promotion, including today in the Tesco store in Fulbourn. 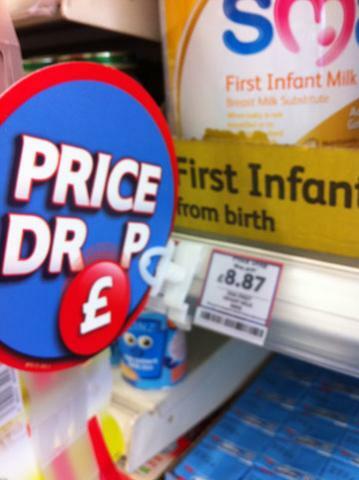 There have been multiple reports of Tesco promoting formula with price reductions. This is backed by point-of-sale advertising in the form of shelf talkers with the slogan 'The Big Price Drop'. The 'Big Price Drop' store-wide promotion is being promoted on the retailer's website and in emails. The pictures below are from Burscough Branch and were taken on 26 September 2011. The website screenshot was taken on 27 September 2011. On 1 October the promotion was reported in Tesco in Stevenage and Baldock. On 3 October, Tesco informed BFLG it had taken action and: "There is currently no red or yellow price reduction point of sale or any "Big Price Drop" point of sale either on line or in store and we are confident all the due dilliegence measures have been issued to stores to prevent this." On 6 October the promotion was reported in the Tesco stores in Alfreton and Fulbourn. The point of sale and price promotion was found to still be in place in Fulbourn on 20 October, despite Tesco's claims all promotions have been removed. If you have seen the same promotion in your local store, please let us know by going to the 'report violations' section. These practices are clear violations of the Infant Formula and Follow-on Formula Regulations (see The Law section). Baby Milk Action has drawn the illegality of these practices to the attention of Tesco and Trading Standards on behalf of BFLG. Products marketed for use from 4 months of age - in breach of WHO and Department of Health policy on promoting exclusive breastfeeding until 6 months of age - were being promoted on the website. These come within the scope of the International Code of Marketing of Breastmilk Substitutes (see The Law section) as these products replace breastmilk during the first 6 months of life. Correspondence with Tesco is given below in which it states it has ended this promotion. If you find any further examples, please report these in the 'Report violations' section. Thank you for your email to Tesco raising concern over our recent " Big Price Drop Campaign" in connection with the Infant Formula and Follow-on Formula Regulations 2007. The Baby Milk lines were accidently included in a list of price drop lines. This was identified on Saturday by the business ahead of the campagin launching on Monday. Stores were instructed NOT to feature any point of sale on any Baby Milk lines this was commuinicated to all our stores. On launch it was brought to our attention that there was "Big Price Drop" point of sale featuring on our website. This was recified with immidiate effect on Monday, the lines removed from the list and the dot com point of sale removed. There is currently no red or yellow price reduction point of sale or any "Big Price Drop" point of sale either on line or in store and we are confident all the due dilliegence measures have been issued to stores to prevent this. As a further caution today we have written to stores instructing them to ensure that they check again that no point of sale is positioned against these lines. We are confident that we have taken the measures to ensure that we are not in contravention of the Regulations. Additional Information: I am contacting you from Baby Milk Action which monitors the marketing of breastmilk substitutes in the UK on behalf of the Baby Feeding Law Group. We have been receiving complaints regarding Tesco promoting infant formula in its 'Big Price Drop' campaign in clear violation of the Infant Formula and Follow-on Formula Regulations 2007. 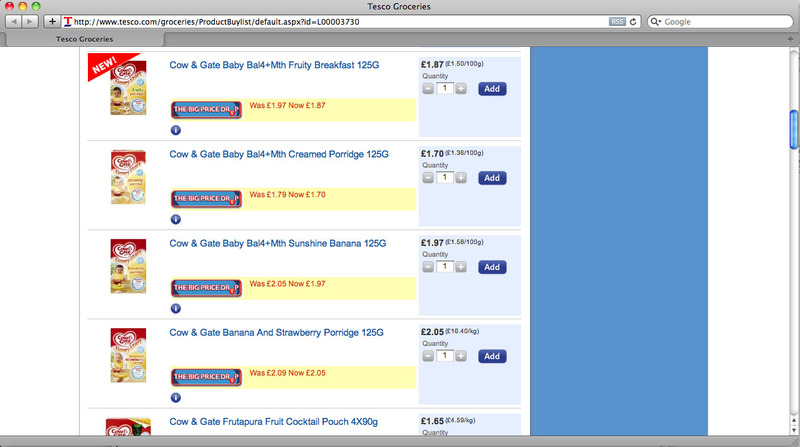 We have posted details on the Baby Feeding Law Group website and indicated that we have contacted Tesco. We will also be contacting Trading Standards and calling for urgent action to stop the in-store and website promotion. Please respond in writing by email. I just took photos of 3 different milks at my local Tesco which were price dropped. I brought it to the attention of the Duty Manager, explained it is illegal and will send an email to Tesco HO once I've got the pics uploaded to the pc.